One of our favorite date spots is a vegan sushi place called Beyond Sushi. [75% because the food is freakin’ delicious and 25% because you can bring your own wine.] Their delicious flavor combinations make for some amazing rolls. As with any food we ever try, we had to wonder if we could make it at home. The answer is yes. Even if you don’t live near a coast where you have access to fresh seafood, you can still feel good about eating this sushi. 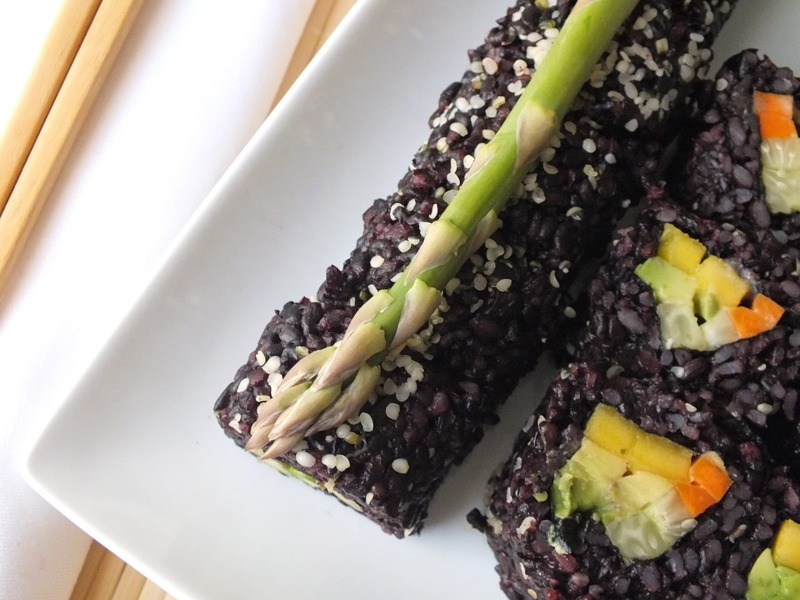 Using organic vegetables, and when possible, buying from local farms makes for a worry-free sushi experience. You don’t have to wonder where the fish came from, or how it was raised, or if it’s really fish at all. 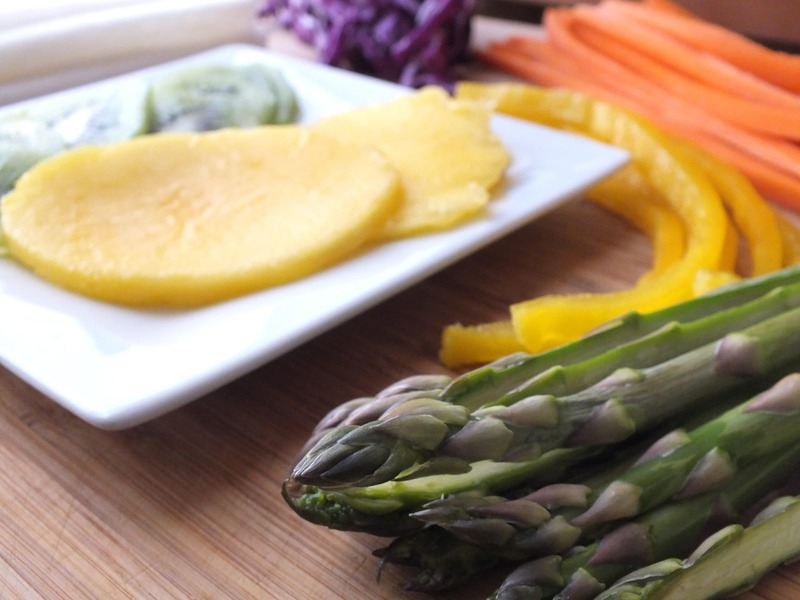 This recipe requires a few special odds and ends and a lot of veggies. Also: patience. 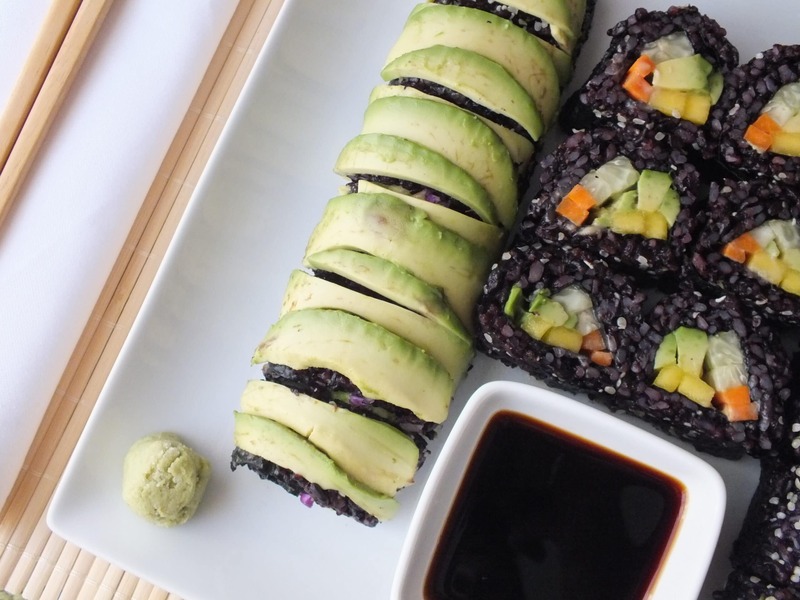 You’ll Need: A bamboo sushi roller. We used a bamboo placemat from Target and it worked like a charm. Stretch out a length of saran wrap and lay the bamboo on top. Pull the saran wrap around the edges and use tape to secure it. Cook 1 cup of rice while you are busy chopping, slicing, and otherwise prepping your other ingredients. After rice is finished cooking, allow it to cool. 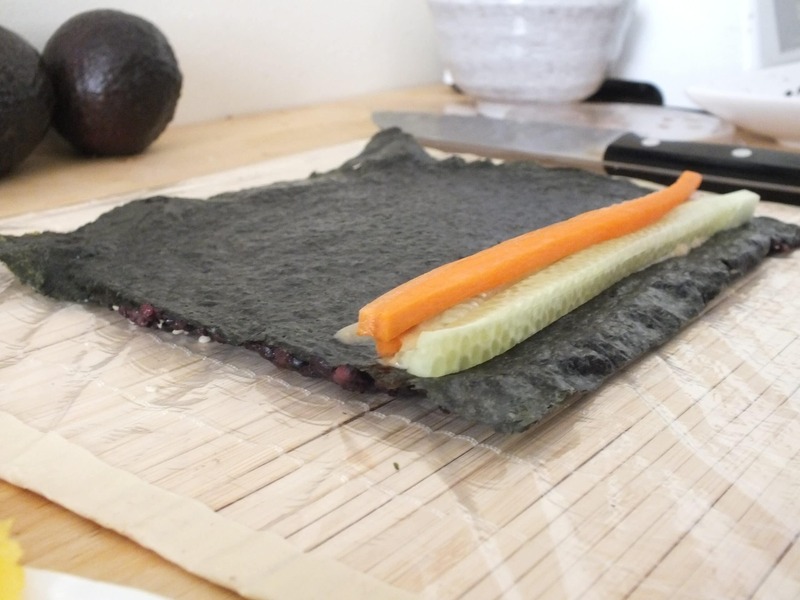 Lay out the sushi mat and lay a piece of nori on it. 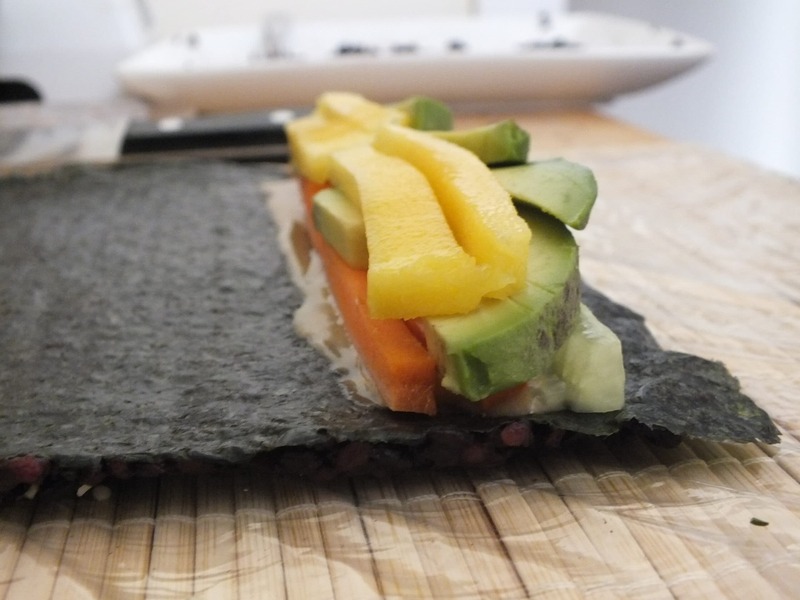 Situate the nori paper near the top of the mat. 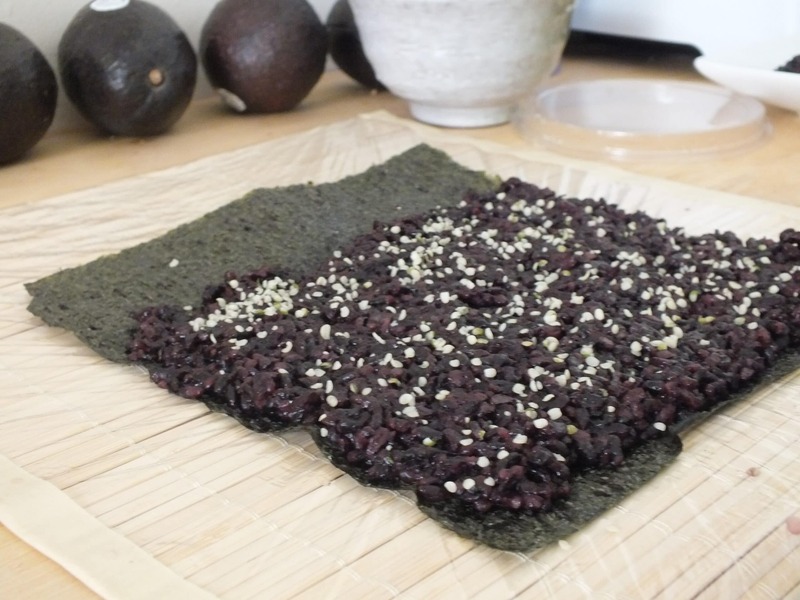 Spoon rice onto the nori and spread it over the surface, approximately 1/4″ thick. [We spread ours a bit too thick for the first roll – 1/4″ is definitely thick enough without being too much rice.] 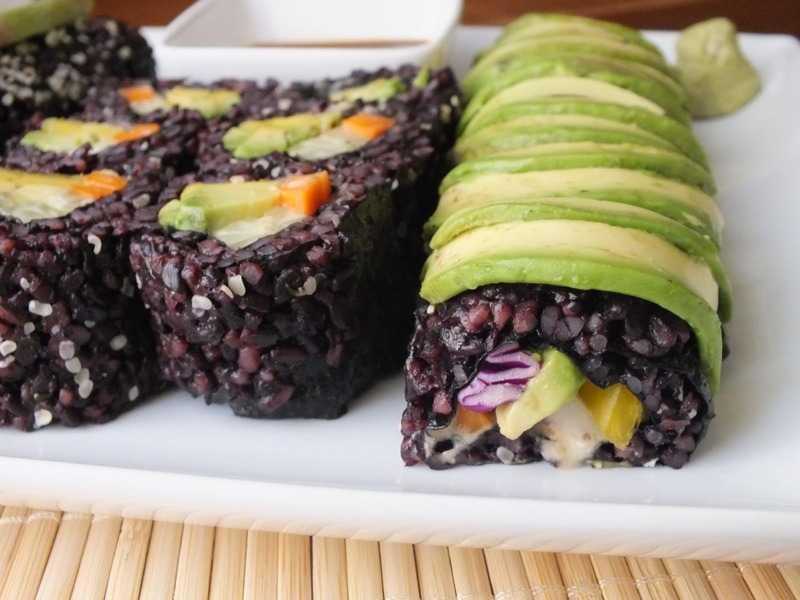 Sprinkle a thin layer of hemp seeds over the rice, or don’t – that’s your call. 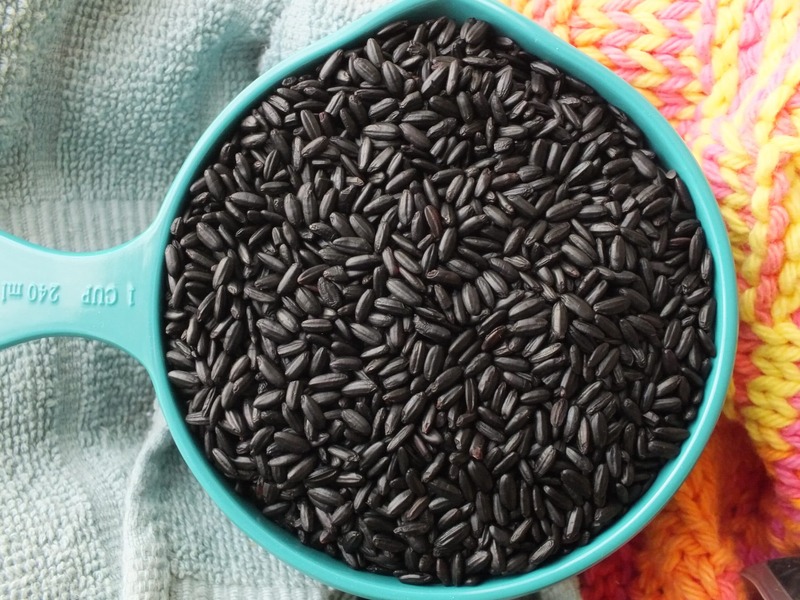 They are a good source of added protein and contain tons of essential amino acids. 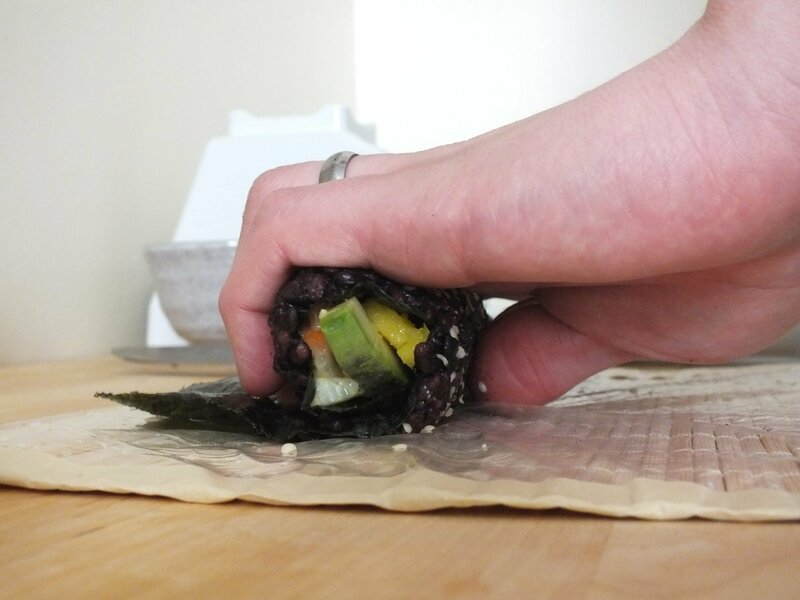 Once you’ve spread the rice onto the nori paper, fold the other half of the mat over the sushi rice. 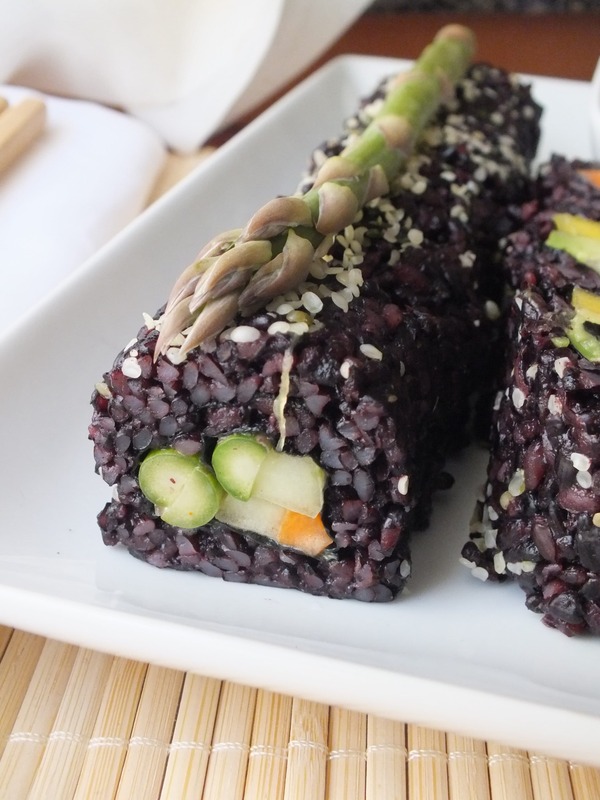 It will look like a bamboo-nori-sandwich at this point. 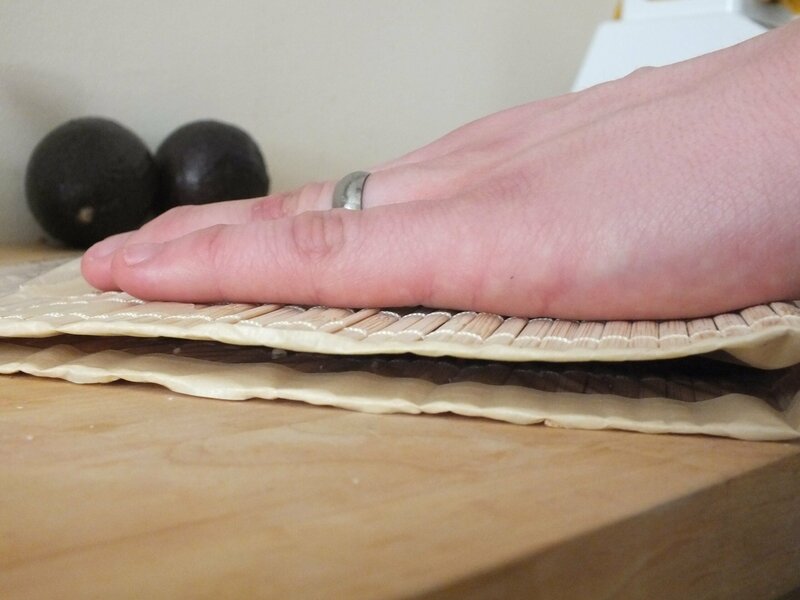 Carefully flip the “bamboo sandwich,” placing the rice side down. 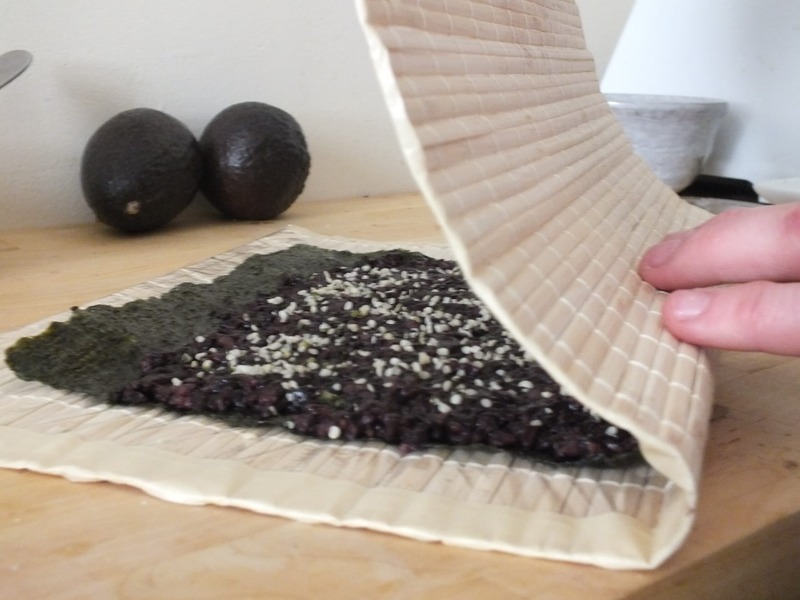 Pull the top bamboo layer away, revealing [hopefully] the nori paper. 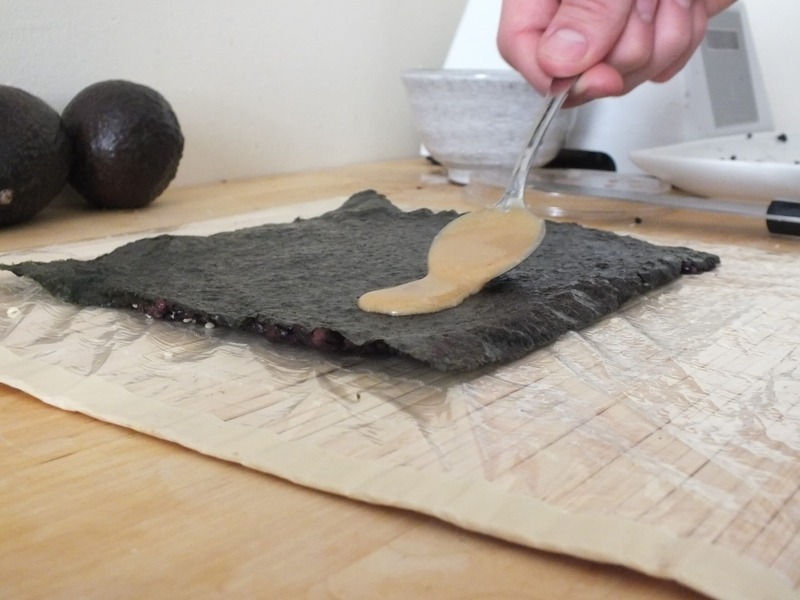 After flipping the roll, spoon some sauce in a thin layer at the bottom of the nori paper. 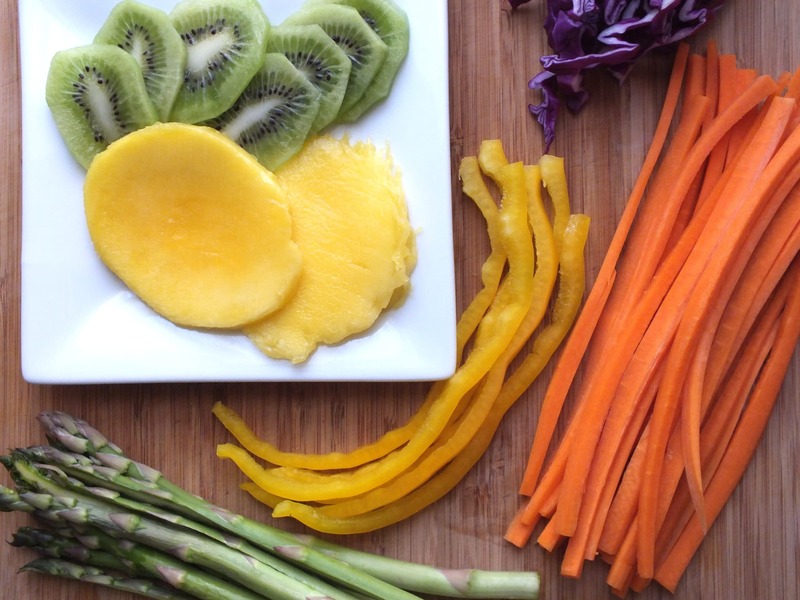 Start adding vegetables/fruits/whatever else you feel like. We created each roll with a different combination of flavors and textures. As a general [and breakable] rule of thumb,a good roll contains something crunchy, something creamy, something sweet, and something savory. But then again, the best part about sushi is that everyone has a different favorite. Combine whatever you like in your rolls – you really can’t go wrong. 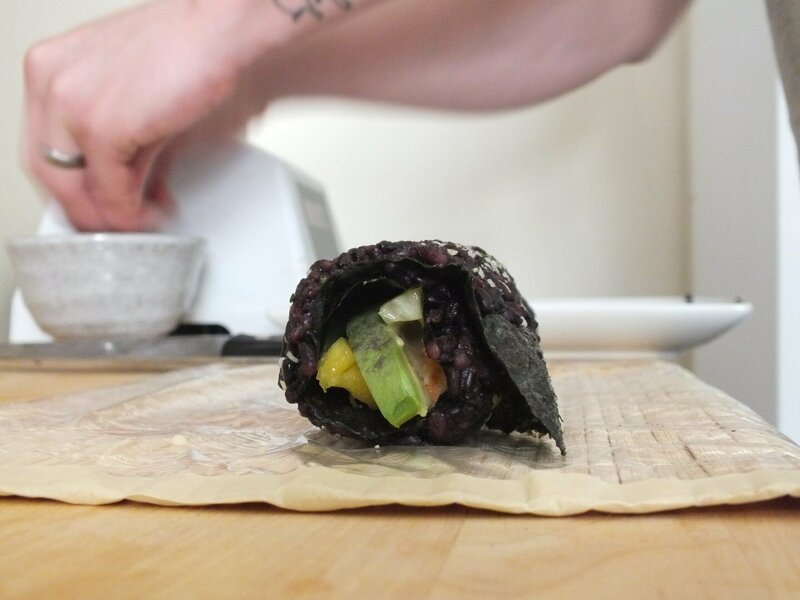 Once you’ve added your choice ingredients, start to roll the wrap. 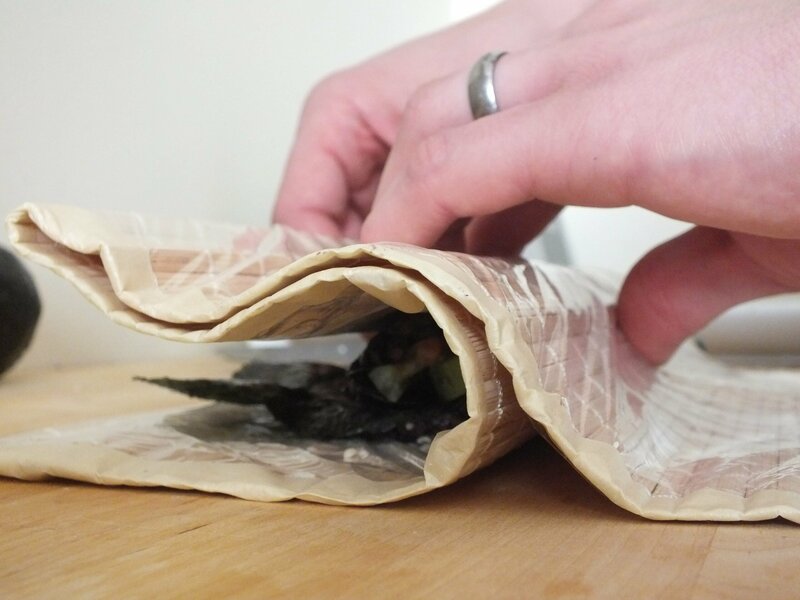 The nori paper will stick with your bamboo, so just start rolling and take a leap of faith. When you get near the end of the roll, gently pull the mat away and finish rolling with your hands. 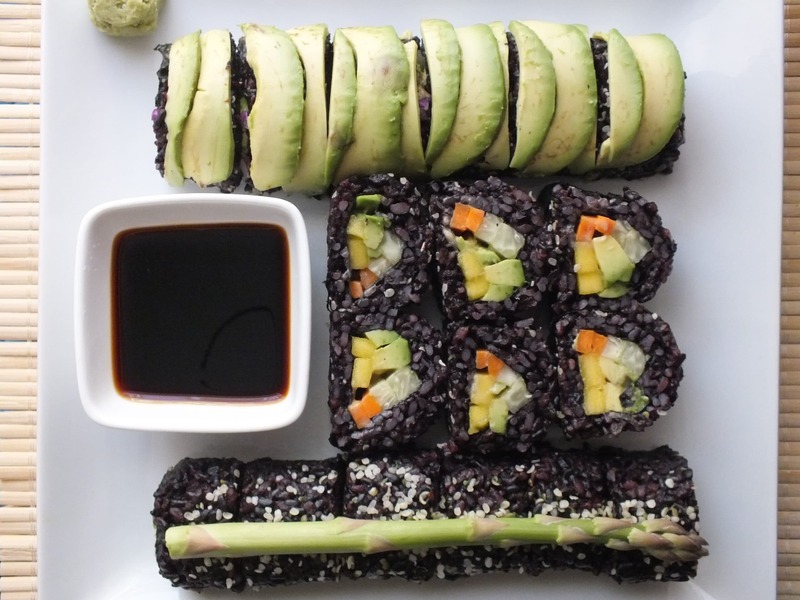 If it looks a little less-than-sushi-joint-worthy, simply lay the bamboo over the roll and reshape it a bit. Slice each roll in half, and then into thirds. Arrange them into rows, or circles, or squares, or whatever looks cool. Then, grab your chopsticks, top off your bite with a bit of wasabi, dip it in some soy sauce, and enjoy sushi from home.